As soon as students finish school and are applying for college they are often rather confused about which subject they ought to study as their major. In most colleges, students need not choose their major subject in the very first year. They are given time to explore options and then come to a conclusion. 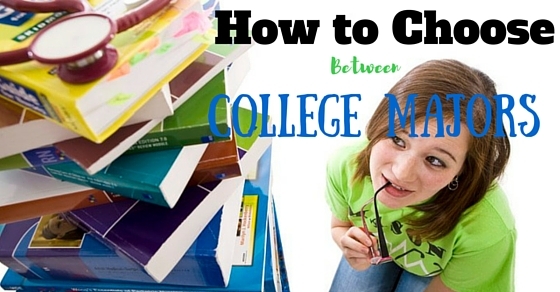 Choosing your college major is not an easy task at all and it may cause students to have a number of sleepless night. The main thing to remember when narrowing down on your decision is that as long as you follow your heart, you need not worry about anything. Choosing a college major for yourself is never easy. This is a dilemma which almost all students have experienced at one point in time or the other. You should draw consolation from the fact that you have been privileged enough to go to college and that is why you should take things seriously. This having been stated, you need not have to come to a conclusion right away. You do have the liberty to take your time and experiment a little. Sit in any class which you might find interesting during the first few months and then only will you be able to come to a conclusion. As mentioned above there is no hurry to take your decision. If you make a rash decision there is no one who is going to be more affected than you in the long run. Spend some quiet moment in contemplation with yourself and really try to listen to your heart and mind. If you are constantly in a state of nervousness and worry then it is going to be double hard to make a decision. This is an important life choice and that is why you should think in a clear manner before taking any step. Evaluate the pros and cons for each subject and is bound to make things rather easy for yourself. While it is advisable that you take your own time to choose your college major, at the same time if you keep on drawing it out for too long, that is going to be nothing but a waste of time and money for yourself. Once you have made your decision after a lot of thought, then only can you start working towards your goals and focusing on your major. If you put off taking the decision, then that is only going to leave you with less time to study. Wasting even one precious day is not advisable when you are in college. If you are really at sea about what you want to do and you do not even have an inclination towards any particular subjects, then rather than choosing a major for college at random, you should take the pains of opting to appear for some quizzes and tests. Based on the outcome of the tests you can know where your strengths and weaknesses truly lie. However this having been stated you should ensure that these are not any random tests which have been gotten off the internet for free. Rather they should be standardized tests which have been prepared and evaluated by professionals. If you think that you need to speak to a teacher, then you need not hold yourself back in any way. Teachers in college are always ever ready to help students who are in a rut and cannot decide what to do. Teachers are skilled professionals who have been around for a long time and have plenty of experience. They are bound to give you important words of wisdom which you should take into consideration for sure. In addition to this, if they have noticed you and your work for a considerable period of time, then maybe they can give you some specific suggestions. At such a time, students are bound to have a lot of questions on their mind. If you as a student find that you too have a number of questions which have been troubling you then rather than sitting quiet about it, you should speak up. At such a time it is advisable that you speak to your seniors in college, as it is likely that they too went through the same thing not too long ago. They might give you valuable feedback about classes which they enjoy and those classes which they regret taking up. You can expect their words to be very honest and straight forward. Rather than taking a random decision, you should spend all your free time gathering information about various majors. Nowadays you need not go very far in order to procure your information all you need to do is log on to the college websites and all the information will be available before you. In addition to consulting your own college website you can always look through other websites. Taking an informed decision will ensure that you feel more confident about the step which you have decided to take. Doing this is certainly going to be time consuming but it will help you in the long run immensely. Even if you feel that the subjects which you are drawn towards are not conventional avenues. You should not let that thing hold you back. Even if it is something which not many people are opting for, this is a ling which will be important in the years to come. Therefore, you should follow your own heart and take the plunge. If you take a calculated risk after a fair deal of thinking, then it is going to yield rich fruits for you in the time to come. This is as long as you continue to work hard and follow your dream till it has been achieved. To choose a college major based on your own personality. First and foremost you need to have some self knowledge and you need to get to know yourself in a proper manner. How can you know what you want to do if you haven’t turned your gaze inwards and done some self reflection? Often it happens that people have wrong perceptions about themselves. They either think too much of themselves or they are insecure and think that nothing that they do is good enough. So before you join college, go on a trip and get acquainted with who you really are as an individual. Choosing a college major based on your personality means following your own heart and doing whatever you think is right. What we do not realize is that often, people conceive us to be a certain way, but our real personality is not even slightly in consonance with how they perceive us to be. So irrespective of what others might think of you or how they might judge you, you must do something which is a reflection of yourself and which truly brings you a sense of happiness. Even if you have been wearing a mask all your life, being in college gives you a chance to come forth and be yourself. Your personality forms the very essence of who you are as an individual. As we all know, no two individuals are the same. People might share similar likes and dislikes but they are two separate entities. If you are confused about how to choose your major, it is advisable that you choose a major which suits your personality. Even if your marks say that you are good in maths, but if you want to study English, then you ought to go ahead and study English as that is what will bring your joy later on. As it has been mentioned above, even if your mind tells you that you ought to take maths because your marks are better in it, if reading and writing poetry truly makes you happy, then you ought to pick the later. There is no point studying something which does not bring you a sense of contentment. When you do a major in college that becomes your area of specialization in study. You will have to devote a lot of your time mastering the subject and if your enthusiasm is much lacking, then everything is going to be a burden for you. One of the chief things which you need to keep in mind when you are taking your decision is that, the subject you choose need not be something which you already excel in. Even if it is something which you are not the best at, but you are interested in it, you should go ahead and take it up. If you love what you do and are serious about it then your marks are automatically going to improve with time. Not everyone who gets good marks has an authority on the subject. Maybe your practical work is much more impressive than your written theory. Prior to taking your decision you need to ask yourself some important questions. Based on your answers to the questions you should either take up the subject or choose another one. Some of the major questions include, why have I picked this subject? Have I taken an informed decision? Have I consulted any professionals? Asking yourself such questions will be of immense help. Rather than picking up any subject which you first set your eyes on, take the decision wisely as your future depends on your decision greatly. At the onset we should know that some subjects are unconventional but with a promising future and then again there are those subjects which do not have any future potential though they are rather popular today. So ensure that you take into account whether the subject which you are thinking about choosing has any future prospects or not. There is no point wasting so much of your precious time and money laboring over a subject which will hold no importance in the time to come. Finally, if you know what job you would like to have in the future, then you ought to ensure that the major which you are choosing has something in common with that job. If you are well educated then that is going to help you bag your dream job. For example if you know you want to be a banker there is no point in taking up Chemistry as a major in college. These are the main things which you need to keep in mind when you are wondering how to choose a college major for yourself. Things might seem complicated and rather tough at the onset, but once you are sure about what you want, you will no longer have a sense of confusion. Each one of us has our own individual talents and abilities and based on where our passions lie we ought to take the decision. This is because after all it is your own life, future and career which is on the line.